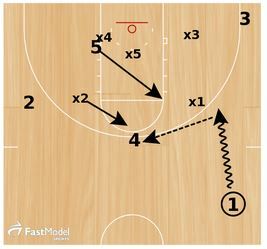 The links below are to all of the basketball plays posted on The Coaching Toolbox. Click the link to see the play. If you are looking for specific types of plays, click one of the category links listed here to see specific types of plays. Regardless of how well designed these plays are, they will not be effective for your team unless they are adjusted to fit the strengths of your players. I recommend taking bits and pieces of them and combining those movements with what you know to work with your players. Successful offensive basketball teams are teams that have developed the skills through practice to pass, cut, catch, dribble with purpose, and shoot. Without working daily during the season and frequently from April to September, there will be no successful X and O execution. Plays don’t win games, players do. Successful plays force the defense into difficult coverages and put players in spots to utilize their skills. 1) How many times will you run each play during a game? 4) What do you do if you run the play to completion with no shot? 5) Do you have plays that develop into scoring attempts quickly to catch up or at the end of a clock? 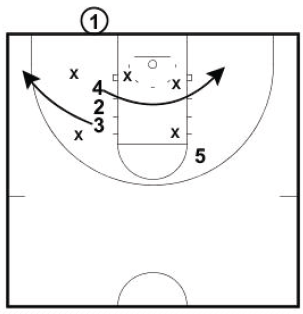 6) Do you have plays that set up or sequence each other? 7) Have you practiced substitutes in all spots that they will play in a game? I hope that helps you to put together a solid plan for how you will best utilize set plays with your team. 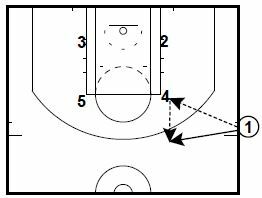 A quick hitter to run to get the ball inside against a 2-3 zone defense. You can also see more of his plays in the Related Posts links at the bottom of this post. Vonn has also served as an assistant coach in the WNBA with the Phoenix Mercury, Orlando Miracle, and San Antonio Silver Stars. He was an advanced scout for the Orlando Magic as well as The Charlotte Sting. 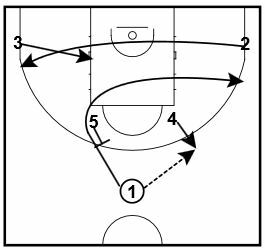 This is a Great Lob Set for your 5 Player or best athlete. The 2 and 3 players will cut in and set inside screens on the top 2 defenders in the Zone. See the rest of this drill here. 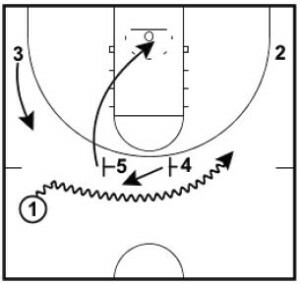 This play is from the Arizona Basketball Newsletter. 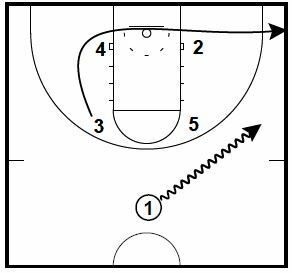 For more screen actions like this Double High Ballscreen, click here. These notes are from a presentation by former Virginia Commonwealth Men’s Assistant Coach Donny Lind. 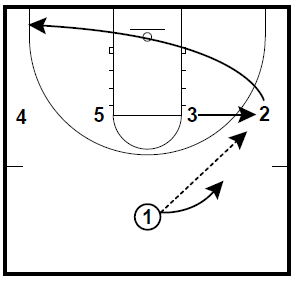 Check out the original post here to see more ball screens utilized by VCU. Looking for more of our best ball screen sets? You can find them here. In this horns had off jumper, 1 passes to 4 then cuts off of 5 into the lane and out to the right wing. You can learn more about these sets here. Hand off to back cut. Click here to get more details on Iowa State Quick Hits. Go here to learn more about what Coach Read has to say on this quick hitter. 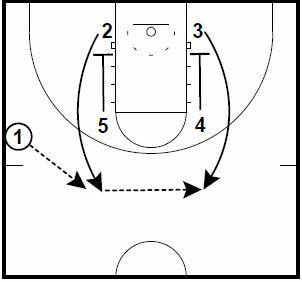 To see the other options on these Iowa State post up plays, click here. The Atlanta Hawks run this action to get Al Horford or Paul Millsap open for a post-up situation. The Double Rip action usually frees them up to establish very deep position. Click here to find more info on this play. You can get more details on this play here. See the rest of this isolation play here. 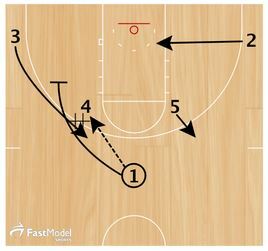 This backdoor play was contributed by Jusin Scanson to the FastModel Sports Basketball Plays and Drills Library. 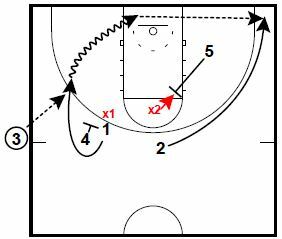 The play is designed to clear out the help defense and set up a backdoor cut. From a horns set, 4 pops out to get a wing catch. 1 cuts through the lane to the weak side corner. 2 starts to cut towards the top of the key as 5 occupies the high post. 3 V cuts to get a catch near the corner. 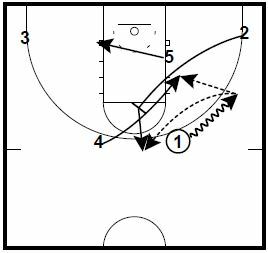 Get the rest of the info on this horns swing backdoor play here. To see the rest of this play, check out the diagrams here. This play is run by the Portland Trailblazers. 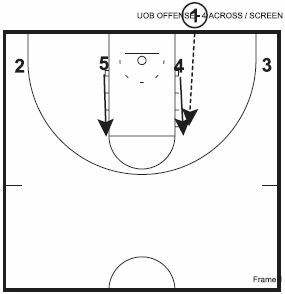 These plays were submitted to FastModel by University of Cincinnati Men’s program assistant Greg Youncofski. You can see the plays in their entirety on this page. 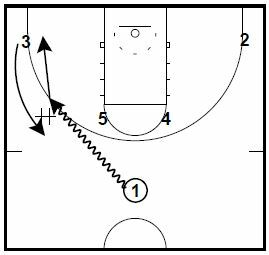 This play is a set with a couple of 3 point shot options. These were submitted by Syracuse Women’s Associate Head Coach Vonn Read. Vonn has also served as an assistant coach in the WNBA with the Phoenix Mercury, Orlando Miracle, and San Antonio Silver Stars. He was an advanced scout for the Orlando Magic as well as The Charlotte Sting. Click here to see more details about this play. To see more about these plays, check them out here. Click here to see more info about these zone sets. This post was made by Justin Scanson. 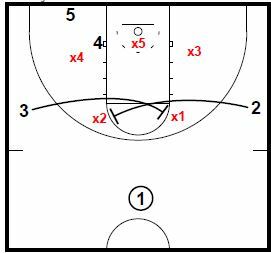 This is a great quick hitter that puts a 2-3 zone in a few tough situations. 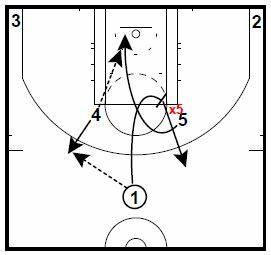 This play works best if 4 is a threat to shoot the 3 at the top of the key. Once 1 initiates the play and swings the ball, quick ball movement and spacing put x4 in a spot where they have to figure out to whom they want to give the wide open 3. 1 Dribbles up the right side until x1 initiates defense. 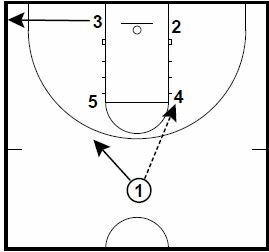 4 steps out for ball reversal as 5 cuts to high post calling for the ball. 3 runs the baseline hard. To see the rest of this quick hitter, click here. 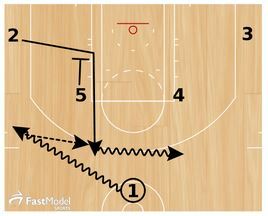 These inbounds plays came from the FastModel Sports Basketball Plays and Drills Library. The first play is an under the basket inbounds play, the second is a side out play. 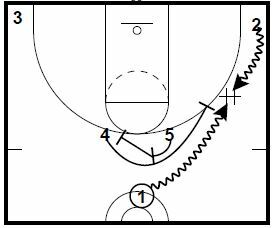 This is a last second play that can also be used at the end of quarters in high school. One of our opponents ran this BLOB to perfection against us a couple seasons ago. We did not defend the action very well and gave up the open shot in the corner to lose by one point. You can see the rest of these plays here. These two plays were included in the Xavier Men’s Basketball Coaching Newsletter. This play is called 4 Across Screens. You can see the rest of this play, and another Xavier Under Out set by clicking here. See the rest of this BLOB vs. Zone play here. You can see more diagrams from Coach Read on this SLOB play here. This play was contributed by former Florida Graduate Assistant and current Fort Myers High School Boys Assistant Kyle Gilreath. 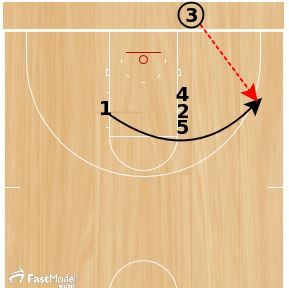 Billy Donovan drew up this ATO with under 10 seconds remaining as the Oklahoma City Thunder trailed by 3 at Orlando. If you’ve followed Coach Donovan for years, you know he loves screen the screener actions for his best players. These plays were run by Thunder and the Cavs early in the 2015-16 NBA season. 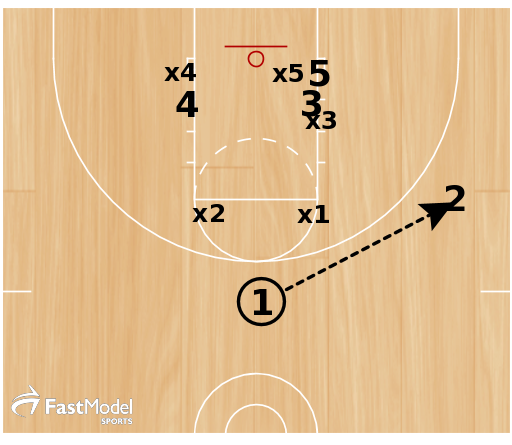 The plays are featured posts in the FastModel Sports Basketball Plays and Drills Library. Note: The numbers are to distinguish between the 5 different players on the floor, not to say that you have to put a traditional “5” player (i.e. center or post player), or a traditional “4” player (i.e. power forward) in those spots if you run the play. If you need a 3 point shot, at the end the game, IMO it is better to put 5 players who are dressed for the game that give you the best chance of accomplishing that. Note #2: The purpose of this post is not to say that you should run this exact play. But, I hope it does motivate some discussion and thinking among your coaching staff as to how you can possibly incorporate some of the actions in this play to your team’s end of game situations, or as to what you can do to counter teams that switch everything at the end of the game in this situation. 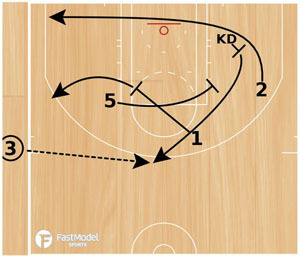 See more of this OKC End of Game SLOB, and the Cleveland SLOB Back DHO Quick 3 play, here. 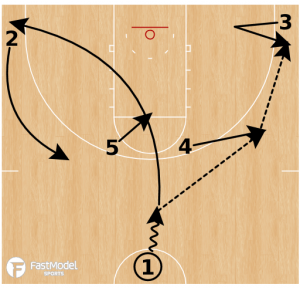 Here are a couple SLOB plays by Gregg Popovich and the San Antonio Spurs. This play is called “Triple”. 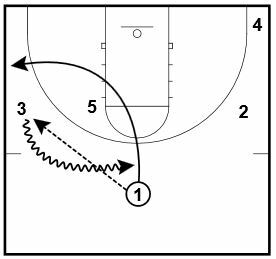 See more details, and find another Popovich SLOB play, here. This play was contributed by Rory Hamilton, Norman North High School. You can see more about this play by clicking here.